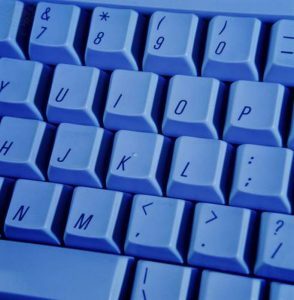 Whatever you type on, whether a computer, smart phone, or even typewriter, chances are very slim that you’re using anything other than a QWERTY keyboard layout. Named after the first six letters that appear on the top letter row and invented by Christopher Latham Sholes, this keyboard layout has been around in a recognizable form since 1873, and had been iterated on for years prior. It was originally designed with the intent that it would prevent the mechanical printing arms of typewriters from clashing against one another or jamming, a design process that took years of trial-and-error to perfect. In pursuing this goal, one of Sholes’s principle design philosophies was the purposeful placement of letters that commonly appear next to one another in the English language apart from one another on the keyboard. The QWERTY layout effectively became the standard Latin-script layout in 1878, when it was included with the Remington No. 2 typewriter, a groundbreaking typewriter upon which most future typewriters were based. Long after typists and designers have stopped needing to worry about their typewriters jamming, QWERTY has held onto its primacy as a keyboard layout, in spite of a host of quirks that would, on the surface, seem to disqualify it from continuing to be so popular. For example, while thousands of English words can be typed solely with the left hand, a comparatively few hundred can be typed only with the right–a disadvantage in a population that is mostly right-handed, though admittedly a boon for left-handed individuals. Additionally, despite being among the most used letters in English, the vowels are, with the exception of the ‘A’, placed away from the home row (the middle row of letters, from which most touch-typists base all their movement). Contrast these quirks against an early rival of QWERTY, DHIATENSOR, named after the placement of its home row keys, on which 85% of all English words can be typed with the home row keys alone. Nonetheless, QWERTY and QWERTY-like layouts (QWERTZ, AZERTY, and QZERTY foremost among them) have proven to have the most staying power among Latin-script keyboards the world over, though in recent decades two newer layouts have gathered dedicated adherents. The most popular of these is the Dvorak keyboard layout. Patented in 1936 by August Dvorak, Dvorak is a non-QWERTY inspired attempt to fix many of QWERTY’s quirks. While it looks daunting, its successful design is undeniable, as it shifts most of the typing back to the right hand, as well as to the home row. On QWERTY keyboards, only 32% of the typing occurs on the home row, as opposed to Dvorak’s 70%. A less daunting, and arguably even better design, is the Colemak layout, published in 2006 by Shai Coleman. Based heavily on QWERTY, and thus easier-to-learn than Dvorak, Colemak increases home row use to 74% while moving only 17 keys from their QWERTY position, as opposed to Dvorak’s 33. Despite the obvious efficiency advantages Dvorak and Colemak hold over QWERTY, QWERTY seems very much here to stay. Layout efficiency, however much it is praised by number-crunchers, has not been proven to result in substantially faster typing, more accurate typing, better posture, or even reduced wrist injuries, and given that QWERTY is what most people learn to type with, Dvorak and Colemak have very little, if any, advantage, over the reigning keyboard layout king. Nonetheless, both layouts (and others) have made a dent in QWERTY’s armor, and the curious would do well to check them out. Keyboard. [Photograph]. Retrieved from Encyclopædia Britannica ImageQuest. KB US-Colemak [Digital image]. Retrieved from https://upload.wikimedia.org/wikipedia/commons/8/84/KB_US-Colemak.svg; image licensed under the Creative Commons Attribution-Share Alike 3.0 Unported license.